Spanish painter and decorator. He was an outstanding pupil of his father-in-law, Juan de Arellano, whose daughter he married in 1663, and whom he succeeded as the most important representative of flower painting in Madrid. He enjoyed a successful career as a decorative painter, regularly working for the Teatro Real of the Buen Retiro (works lost today), for which services he was given the honorary title of Pintor del Rey in 1689. 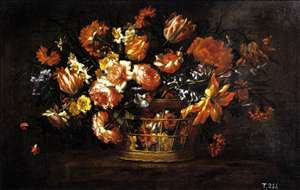 Prez specialized in paintings of bouquets and garlands of flowers. He also painted figures and earned a reputation as a designer and painter of theatrical and festival decorations at the court of Madrid. According to Palomino, who may have known Prez, he collaborated with Arellano, sometimes painting the figures in his pictures. His most famous work in the field of flower painting was the Camn Dorado of king Charles II, a sumptuous bed-chamber constructed between 1689-1691. The decoration of this chamber was to consist of fifty-five flower paintings on panel with gold backgrounds, some painted on both sides, of which twenty-seven appear to have been completed by Prez himself. 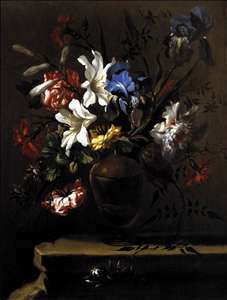 Although as a painter of flower-pieces he must have been profoundly influenced by Arellano, Prez showed a strong personality and independence in his earliest such paintings: for example in the signed Still-life of Flowers (1665, private collection), which shows an artfully arranged bouquet beside a bunch of unarranged flowers, Prez reveals a delicacy of touch surpassing that of Arellano. In two flower-pieces the bouquets are arranged in bronze urns with relief decoration inspired by the Antique (1666, Cambridge, Fitzwilliam; 1678, private collection). The full-blown blossoms are modelled with an extraordinary, velvety chiaroscuro and are swept by a sense of movement unparalleled in Arellano s works. 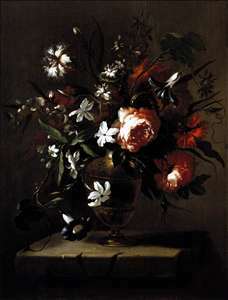 They were probably influenced by Italian flower paintings, such as those by Mario Nuzzi and Paolo Porpora. 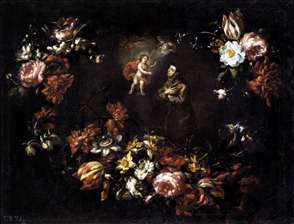 This influence can be seen in the signed Garland of Flowers with St Anthony (Madrid, Prado), in which the figures are probably by his own hand. In 1689 he was appointed court painter by King Charles II. He died in 1693 when falling off a scaffold in 1698, working in the decoration of the palace of the Duke of Montelen. See more details about "Garland of Flowers with St Anthony of Padua"